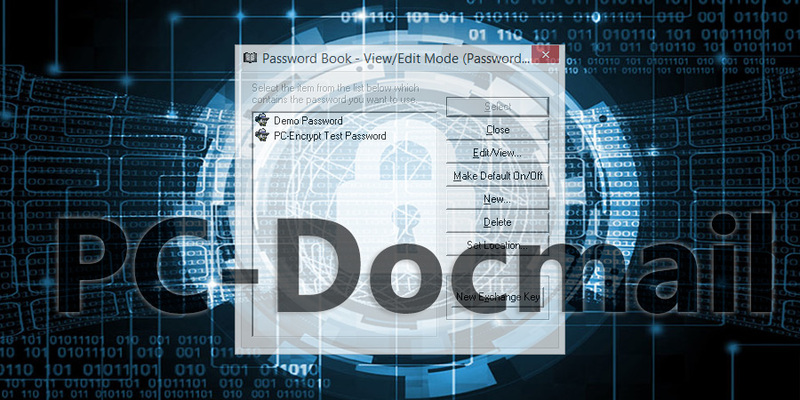 PC-DOCMAIL encrypts, compresses and sends any file, Direct-to-Desktop by E-Mail. ALL Windows. ALL E-Mail. SIMPLE! STRONG! FAST! Recipient decrypts and displays the decrypted content with one mouse click. Send important confidential information to customers regularly by email. At the same time, present a focused marketing and customer service message of interest to the customer. PC-Docmail works with all popular Email software and text applications for Windows 95/98/ME/XP/NT/2000, to decrypt Email messages which were encrypted by A-LOCK and/or PC-Encrypt. The encrypted message can be the result of encrypting any type of file such as text, HTML, Word, Excel, PowerPoint, PDF, etc. There is no registration required for PC-Docmail. Installation of PC-Docmail results in the PC-Docmail icon appearing on the computer’s tray bar, next to the time indicator. You and the sender of the encrypted information must share a secret password, which can be exchanged via telephone, fax, web site, etc, or can be generated and securely distributed via our free Key-Exchange service. Upon receipt of the encrypted message, the recipient clicks the PC-Docmail icon on their computer, and the encrypted message will be decrypted if the correct password is in the Password Book; otherwise the recipient is prompted to provide the correct password. The decrypted message will then appear immediately and the decrypted copy is automatically saved in the “Documents” folder residing in the same folder with the .exe file. Various convenience features are included as described below, including the Password Book, which can be shared with the companion “A-LOCK” encrypt/decrypt Email software (free download HERE ), and the File/Folder “PC-ENCRYPT” security software (free download HERE ). Tiny icon on user’s computer. One mouse click on the icon decrypts and displays the private document/file. Core server software personalizes and encrypts customer information automatically in volume. Compresses and encrypts any file type with specified customer password, and sends as an encrypted, encoded, E-Mail text message – no email attachment. An attractive customer service message can be prominently displayed. To decrypt and view the following encrypted documents/information, first download and install OneClickProtect (280KB), which will install a small icon on the tray bar next to the computer’s time display. This software does not modify any registry settings, and includes an uninstaller. (or, if you prefer, use our “A-LOCK” with “Options” set to “Display Using External Viewer”).